Nativa Menopause Complex is designed as a combination of herbal remedies, phytoestrogens and vitamins needed by women as they age and have to go through the side effects of menopause. The formula ensures the well being of the person taking it, the manufacturer promises, and it is also a good ally for supplementing the need for nutrients as the body ages. Nativa Menopause Complex is made by a New Zealand company, but it can be purchased by people living elsewhere. Here is some more information on the product that can help you decide whether this is a good choice for you or not. 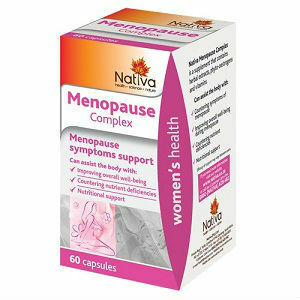 What Does Nativa Menopause Complex Contain? We notice that this natural menopause supplement is based on red clover extract. Used traditionally for treating mood swings and depression experienced by women going through menopause, red clover has also been tested clinically for its contribution in reducing hot flashes and other symptoms of menopause. It is also a great thing that Nativa Menopause Complex contains phytoestrogens that contribute to hormonal balance, and plenty of vitamins. The recommended dosage is one capsule in the morning and one in the evening, each time after a meal. The pricing listed for Nativa Menopause Complex on the manufacturer’s website is 149R, and no conversion is offered. We did not see any clear guarantee being offered on the manufacturer’s website, but you can contact them through their online form, or using the other contact details that are readily available. Nativa Menopause Complex sounds like a good solid formula, since it combines the effects of herbal remedies with vitamins and nutrients needed by women when they experience the onset of menopause. Although there are herbal extracts not included in this recipe, and known to have great results in combating menopause side effects, it looks like this supplement can help you tremendously. Jackie Horowitz	reviewed Nativa Menopause Complex	on February 2nd	 and gave it a rating of 2.5.